In 2010, more than 4 million adults in the United States were under probation supervision, according to estimates from the Bureau of Justice Statistics. Increasingly, the role of probation officers—the correctional professionals who supervise these individuals—has shifted from monitoring offender compliance with court orders to helping people change their behavior. This more inThis is a photograph of a very tall stack manila envelopes, each of which is stuffed with papers. tense involvement of probation officers with offenders involves exposure to many new stressors. A recent study by Kirsten R. Lewis, M.Ed., Ladonna S. Lewis, Ph.D., and Tina M. Garby, Psy.D., examined whether specific caseload events are associated with stress and burnout among these professionals. To provide a context for their study, Lewis and colleagues reviewed the changing role of probation officers. They note that during the past decade, probation officers have taken on many responsibilities associated with evidence-based practices—including conducting risk assessments, collaborating with offenders to develop problem-oriented case plans, matching offenders with appropriate services, acting as models for positive social behavior, and implementing techniques that promote cognitive restructuring and behavioral change. Because of the increased involvement in the lives of offenders under their supervision, probation officers are exposed to many traumatic situations. For example, they interview victims, assess offenders’ histories, conduct home visits, develop relationships with key individuals involved in offenders’ lives, and witness the impact of offenders’ recidivism and incarceration. Research indicates that exposure to the traumatic experiences of others can affect human-service professionals and that such stress may lead to burnout: emotional exhaustion, losing track of personal needs, and low job satisfaction. Officers had been in the probation field for about 10 years, on average, and in their current assignment for 3.5 years. All of the measured caseload events (e.g., a violent offense by a supervisee) and victimizations (e.g., officers being personally threatened or assaulted) were associated with higher reports of “compassion fatigue” and safety concerns, and many of them were linked with stress and burnout (see graph). Officers who reported higher numbers of traumatic caseload events and victimizations also had higher scores in the areas of burnout, mistrust, sexual issues, family problems, anger, distorted world-view, social/emotional isolation, and feeling overly responsible. Increases in traumatic stress were directly related to length of probation career after the researchers accounted for effects attributable to life stages. Although research from other regions is needed to determine how widespread the impact of traumatic stress among probation officers is, these findings suggest that interventions to mitigate the negative impact of job-related events on these correctional professionals are needed. As in other stressful occupations, knowing what to expect may help probation officers. Education and orientation programs might help officers identify possible caseload events and anticipate their personal impact, allowing officers to identify early signs of stress and burnout, engage in anticipatory coping, and seek support when needed. Such programs could mitigate the negative impacts of caseload events, enhance the resiliency of probation officers, and improve their ability to implement evidence-based practices and their overall quality of work. Such measures may also decrease the rates of burnout and job turnover and improve job satisfaction. Three hundred and nine adult probation officers from three states who reported particular events related to offenders in their caseloads scored significantly higher on measures of traumatic stress and burnout than officers who did not experience these caseload events. 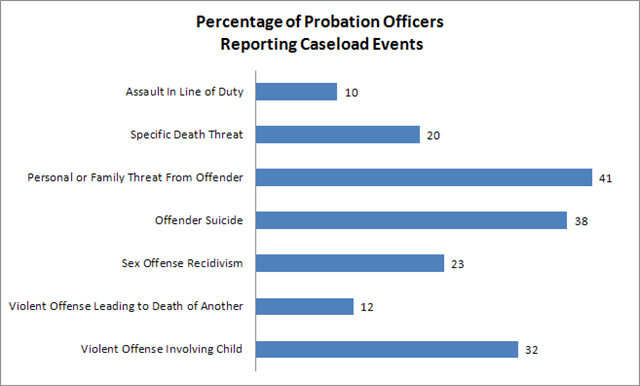 The percentages of probation officers reporting these events are represented in the graph.